* Gains up to 13RWHP and 15RWTQ! More flow equals more power and Airaid MXP series intake systems give you the best of both worlds. These intake systems feature Airaid's new large, one-piece, rotational-molded air box and totally redesigned air intake tube. These new one-piece air boxes house Airaid's exclusive Synthaflow technology air filter which, when combined with the CAD-designed intake tube, provides improved horsepower, torque, and MPG. 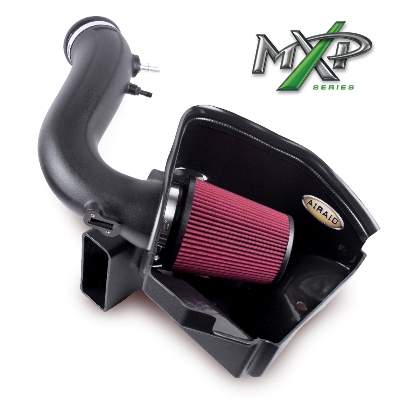 All MXP series intake systems include all of the necessary hardware and easy-to-follow instructions for a quick and hassle-free installation. No one else gives you the bold clean styling of our Aftermarket Dress Ups, Suspension and Performance Parts for your American Muscle Car like UPR Products! Click Here for Instructions Click Here for Dyno Results Fits these Vehicles: 2011 2012 2013 2014 V6 3.7L V8 Mustang Roush & Saleen Vehicles. Made in the USA!